My second year announcing the home games for the Bulldog Nation! I only counted 3 errors on my part…although there were probably several more. Turns out this is a pretty fun gig! So we are into the first two weeks of the school year and things have gone fairly smooth. Classes are going really well. Most of the students are adjusting to the flip model and there have been lots of great interaction with other students and myself. It continually amazes me how creative and awesome the teenage brain can be! A couple of big differences to the start of the year this year compared to last: we (we being my teaching buddy Kristina and I) modeled what we wanted to happen the first full week of school and we broke all of the lessons up into individual components (the entire lesson is also available). Everything is ready ahead of time and the kids can watch whenever they can. I have also relaxed (a little) the due date for homework, so that there is some flexibility for the kids. As long as they are working I think that everything will progress in a way that benefits each individual student. The great Twitter experiment is not quite going as well as I had hoped it would to this point….I know that tons of kids live here, but getting them to post something a little bit nerdy has been challenging. I have mentioned several times “Own your nerdiness, don’t worry about your followers! !” There have been some really great things that the kids have posted into Twitter and some really positive conversations that have taken place there. Maybe I should plan a social event – A Twitter Chat – and award a badge in Edmodo for all of the kids that participate. Also new this year is interaction in Google Docs. I made the calculus kids post a problem into Google Docs and comment on each other’s work. These were the rules: each group pick one problem (I had a list for them to choose from), one person put the problem into Google Doc, everyone comment with positive feedback on two problems. The interaction was great and the best part: there were several kids who were finally able to understand some of the more difficult problems. Teenagers just have a way of saying things that only other teenagers get. I need to use this more often! Knowmia.com came out with an assignment builder late last spring and I didn’t quite have enough time to give it a really good checking out (soccer and first year flipping were keeping me busy), but I have started playing with it quite a bit more now that I have some time to do it. It provides a great way for me to organize my lessons by topic, subject, whatever, for the kids to view. I haven’t really used the question part of this yet and since I teach math I’m not sure how much I will use that part, but it looks really great! Last but not least – this will be my second season as the voice of the Bulldogs for all of our home football games. 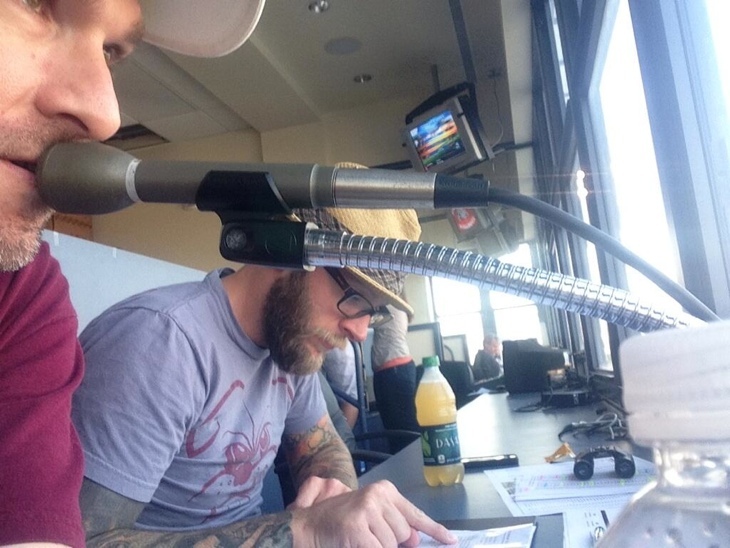 I had the opportunity last year to be the announcer and after a really shaky first game – it got better. I was really surprised by all of the direction that you get as the announcer. It really is a production! This year, my spotters and I are all over the action! Regan and Liz help me out and we had the best time Friday, our first win over Edmond North in several years!! The biggest mistake I made was confusing two different car dealerships with similar names…thats a big one! And I referred to the football game as a football match, which isn’t necessarily incorrect (in most of the world), but in America its a football game!